Then I had to go back and correct the line because I typed it wrong. It’s Carl Linstrum, not Carl Anderson. So I retyped Linstrum and continued on. Next time, same thing happened. I typed Carl Anderson again. You see, Linstrum isn’t natural for me. Carl ANDERSON is very natural. My brain auto-corrects to it. My grandfather Theodore Carl Anderson. My Anderson ancestors would have immigrated to America about a generation after the family of the fictional Carl Linstrum. While O Pioneers! doesn’t specifically describe Carl’s background, he seems to be a first-generation Swedish-American, born to recently arrived immigrants who immediately traveled west to this small Swedish community in Nebraska. My ancestors didn’t go that far. Carl Anderson never left the Atlantic coastal region after his boat arrived. He and his wife eventually settled in Connecticut. I can identify with Carl Linstrum, picturing him not much different from my grandfather. I could easily imagine my grandfather as a young man climbing a telegraph pole to rescue a kitten for a little boy. He was always happy to help others. There’s another personal connection that I enjoy with Willa Cather. While she wrote far more about Nebraska, Cather’s first ten years were spent near the idyllic Blue Ridge Mountains of Virginia. That’s my land! I have deep roots there. The Blue Ridge Mountains were home to my grandmother—the woman who married that first-generation Swedish-American Theodore Carl Anderson. 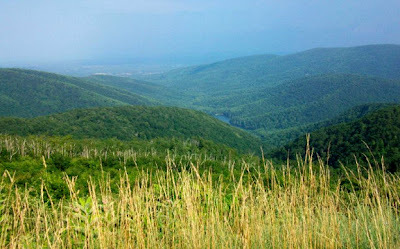 My grandmother grew up in Luray, Virginia, just 60 miles south of Cather’s birthplace in Gore, Virginia, near Winchester. Both my grandmother and Cather retained a lifelong love of the Blue Ridge Mountains. Cather frequently shared about her resentment at being dragged off to that depressing flat prairie land of Nebraska. Cather came to terms with Nebraska through her fiction, but if you ever get the feeling that Nebraska is a compromise substitute for her original love, it’s because her heart belonged to the Blue Ridge Mountains. I can connect with that. Our family vacationed in the Blue Ridge Mountains last year. 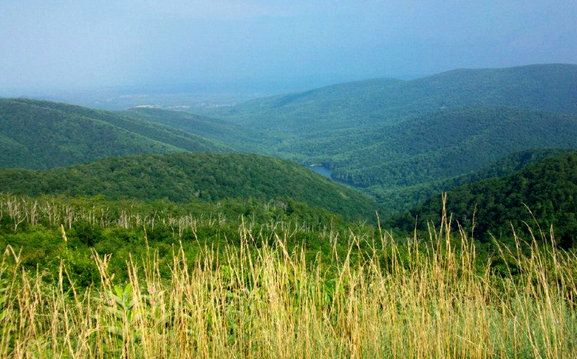 looking down on the Shenandoah Valley of Virginia.